Of the three Greek Islands we visited, Paros was our favourite. From the gorgeous fishing villages and beautiful coastline to the picturesque mountain town of Lefkes- there is so much to explore. It’s much more relaxed than Mykonos with an “off the beaten track” vibe, while still being family friendly. The island is less than an hour ferry from both Mykonos and Naxos. It’s best to hire a car when you arrive at the port of Parikia- there are so many options and people will come to you to organise as soon as you arrive. You can drive around the island in just over an hour- so it doesn’t really matter where you stay, you can still explore everything the island has to offer. Naoussa and Pariaka are the two main towns on the island. Both beautiful fishing villages, but Naoussa has the edge when it comes to beauty, shops and dining and proximity to the best beaches. The second week we stayed at VILLA VANTA a 3br villa in Drios on the south of the island. Drios is a tiny fishing port with a small pebble beach, a few tavernas over looking the sea and some great local restaurants in the one road village. Our villa was basic but comfortable with full kitchen, air con 2 bathrooms and 3 bedrooms over two levels. 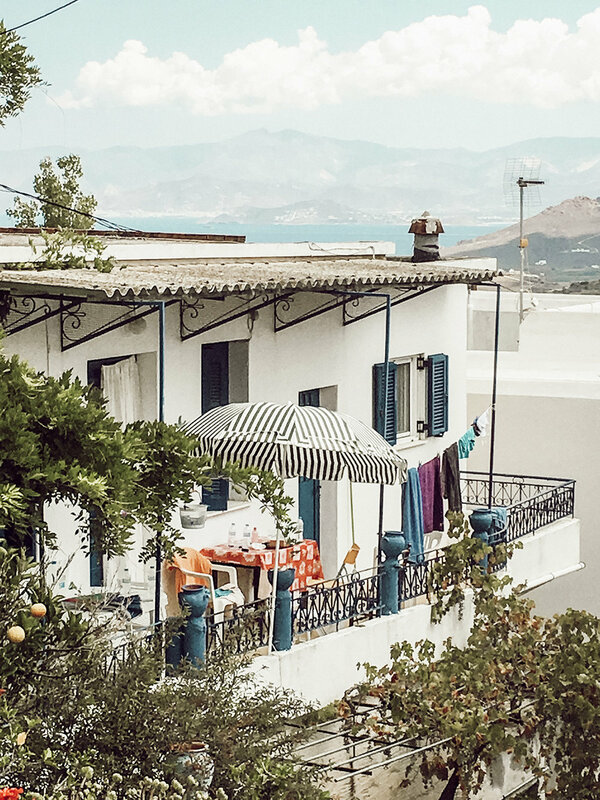 The balcony had a view to the sea in the distance and surrounded by semi rural feel of dirt roads, a hundred metre walk to the waterfront and tavernas. It was also a short 5 minute drive to Golden beach, our favourite for lounging on sunbeds, swimming and eating dinner (i.e. cocktails) at sunset. KOLIMBITHRE | Probably the most famous Paros beach because of it’s geology is located about a 10 minutes drive from Naoussa. The rock formations coming out of the most crystal clear water are just stunning. It’s like swimming in a fish bowl. Go early with kids, turns a bit party in the afternoon. And it gets really hot. GOLDEN BEACH | We adored this long beach sandy beach on the south east of the island. It has calm shallow waters perfect for kids. Lots of sun bed options at around 12 Euro per set. 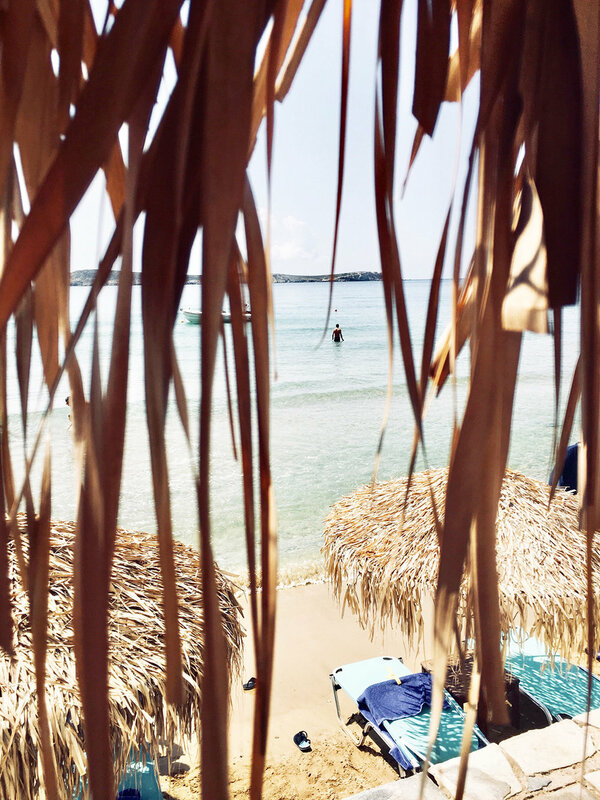 This is where you come for watersports, snorkelling, scuba diving and day trips to Anti Paros. We tried paddle boarding and the boys did the donut of the back of the speedboat thing while I sat in the boat with my heart in my throat! We often had an evening cocktail here while the kids ate chips and played on the beach. DRIOS BEACH | our local beach walking distance from Villa Vanta- crystal waters but the pebbles make it not that toddler friendly for those who like to eat them! SANTA MARIA | located on the north west of the island- beautiful clear waters, less crowed option to the other beaches. Get for families. KALOGEROS BEACH | basically a clay spa where you take clay from the clips to little water holes on the beach and smash it to make a puddy, let it dry then jump in the ocean to wash it off. For the most authentic food on the island dinner at Anna Mumma’s Traditional Food in Drios village is a must. Very casual, family friendly bistro feel. Large menu, something for everyone. Moussaka is out of this world & best Rosé I’ve ever had! The Green Project, also in Drios, has a great courtyard vibe with good music, cocktails and food. Family friendly too. For fresh seafood Noussa Village has some beautiful options as well as the Drios Tavernas for a little more laid back vibe. You get to select fresh fish from the display and have it grilled to perfection. If you manage a date night, go for a drink at Barbarossa in Naossa and an absolute must is the coolest Jazz bar sitting at the edge of Drios Beach after all the tavernas. The ginger cocktail is the bomb! Most of our family dinners were on Golden Beach – just makes it easy to eat while kids play. Just your usual burger/pizza options, but Green Project has a sister restaurant on the beach that has fresh salads for a healthier option. We definitely hit our chip quota on this trip. LEFKES | the most beautiful Mountain town in the middle of the island is a must. 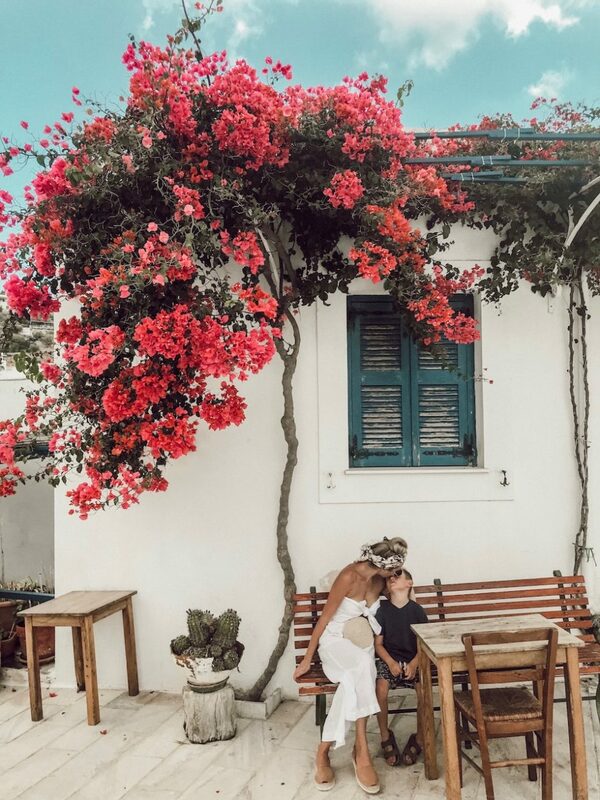 I had the iconic image of this little corner with Bougainvillea on my vision board for years. After realising it was in Lefkes- we went on the hunt to find it. You can get lost in these gorgeous lanes. So rich in history- lots of options for ice-cream and to grab a bite and get lost in the beauty. Definitely a highlight for us. 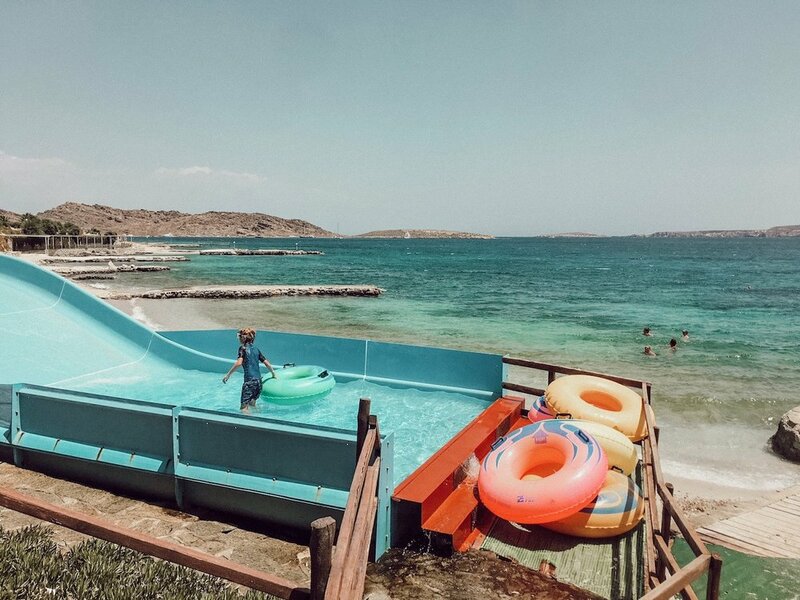 Aqua Paros Water Park is a must for older kids. Has a bit of a retro feel to it and all the slides all ending in the ocean. Definitely a highlight for Archie.We were also recommended to take a day trip to Anti Paros a little island 15 minutes boat trip away, but best for older kids as it is quite rocky and a little intrepid. Along with NAXOS ( coming up next week) PAROS was the highlight of our trip. Definitely recommend if you are coming to Greece.